Free Poker Strategy Guides (Updated 2019) - 100+ Expert Articles! So, you want to learn how to play poker but you don&apos;t know where to start? Well, you&apos;ve already started because you&apos;ve landed on this page. Well, congratulations, and welcome. For new players, tight-aggressive is the most profitable style to play. With poker, while it&apos;s clearly important to understand what beats what, it&apos;s perhaps more important still to have a feel for what&apos;s most likely to beat what. By that we mean knowing, for example, that top two-pair is a strong hand and its likely to win the pot, but it&apos;s far less likely to win on the river, say, if there are four clubs on board and you don&apos;t have a club in your hand. The only way you get to understand all this is with a little experience, which is why we suggest the first thing you do is sign up to an online poker site and play for free. All online poker sites offer free games, which act as a handy training ground for the real thing, so jump in and have a splash about. While “fun-money” poker is a lot like the real thing, it&apos;s also NOT like the real thing in the sense that people don&apos;t care about fun money. That&apos;s why you&apos;re likely to see multiple all-ins on many hands, often when players have less-than-premium holdings. Stay here too long and you&apos;re likely to form a skewed vision of the game and that would be a BAD THING. So, when you&apos;re done splashing, it&apos;s time to play for real money. Start at the lowest stakes available online or play for pennies with friends. Essentially, you want to build up the most experience possible, and see as many hands as you can, while losing as little money as possible. While there are many poker variants, we recommend beginning with No Limit Texas Hold&apos;em, because it&apos;s the most popular game by far and that means it&apos;s always easy to find games online. It also means it&apos;s the most widely discussed game on internet poker forums, like ours, and so there&apos;s a wealth of information to help you in your mission to master the game. In poker, you don&apos;t have to have a made hand to retain equity in the pot. You can have straight draws and flush draws too. Perhaps you have AcKc and the flop comes 6c10c2h. You may not even have a pair yet, but your hand is still strong because you are one card away from making the best hand possible. You can bet this hand, by all means, a move called a “semi-bluff.” This allows you to win the pot in two ways, either by forcing opponents to fold or by making the nuts when they call. If you intend to call a bet with a draw, it&apos;s important to understand the odds of making your hand and ensure that you&apos;re getting the right odds, or likely future payout, from the pot by calling. Once again, we refer you to our section on pot odds, which we advise you to absorb thoroughly. Understand, above all, that poker strategy is situational and for that reason you must always pay attention to what other players on the table are doing. That might be a tall order when you&apos;re just starting out, so to begin with, try at least to keep an eye on the player to your right and the two players to your left, as these are the players you will likely be involved with most often. Are they aggressive or passive? Is the player to your right playing too many hands? He can&apos;t have a monster every time, so call him more often in position, or raise him occasionally and see if he can take the pressure. The concept of position is one of the most important in poker and often overlooked by new players. The dealer button is the most advantageous position on the table because it means you will always be able to act last for the rest of the pot. The spot to the right of the button is the second-most powerful and so on, in descending anti-clockwise order around the table, until we get to the lowly small blind. Here&apos;s an extra special secret: over your poker career, you will win more money from the button than from any other position. And speaking of poker careers, good luck with yours. Our poker strategy articles cover a diverse range of topics and poker-related issues, including advice for new players, tips for tournament and cash play, introductions to online gambling wallets like Neteller, advanced theory, and reference guides on how to play Texas Hold'em and Omaha. Our poker strategy articles also introduce you to strategies for limit play, sit and gos (SNGs), and freeroll tournaments. You don't have to play internet poker to benefit from our online poker strategy articles - most of the strategies covered here are applicable to poker in general, both online and off. If you have further questions about the strategic side of the game, the CardsChat poker forum is the place for you. Feel free to direct any questions you have to our friendly forum members and get advice from numerous skilled poker players, especially in the poker strategies forum. If you&apos;re ready to learn more about the game of poker, we have a wealth of resources to help you along the way. We&apos;ve built up an extensive poker strategy section that will help you start climbing the internet poker ladder. We cover all the important topics that online poker players need to learn to become a master strategist and we promise you&apos;ll experience a great poker education within these pages. Why is Poker Strategy Important? You might hear some say that playing poker is simply a game of chance - that Lady Luck determines who wins and who loses. Well, they&apos;re wrong. Poker is a game of both luck and skill. It&apos;s true that “I&apos;d rather be lucky than good” is a phrase often muttered ruefully by poker players, usually after they&apos;ve just suffered their third bad beat in a row. But the truth is good luck (and bad luck) is a short-term phenomenon and in order to become a long-term real money winner in this game, you need to study. Texas Hold'em may take minutes to learn but it takes a lifetime to master. It involves a huge amount of strategy and counterstrategy that will put your math, psychology and deception skills to the test. The good news is, though, you only need to be better than the players you&apos;re playing against to be a winner. 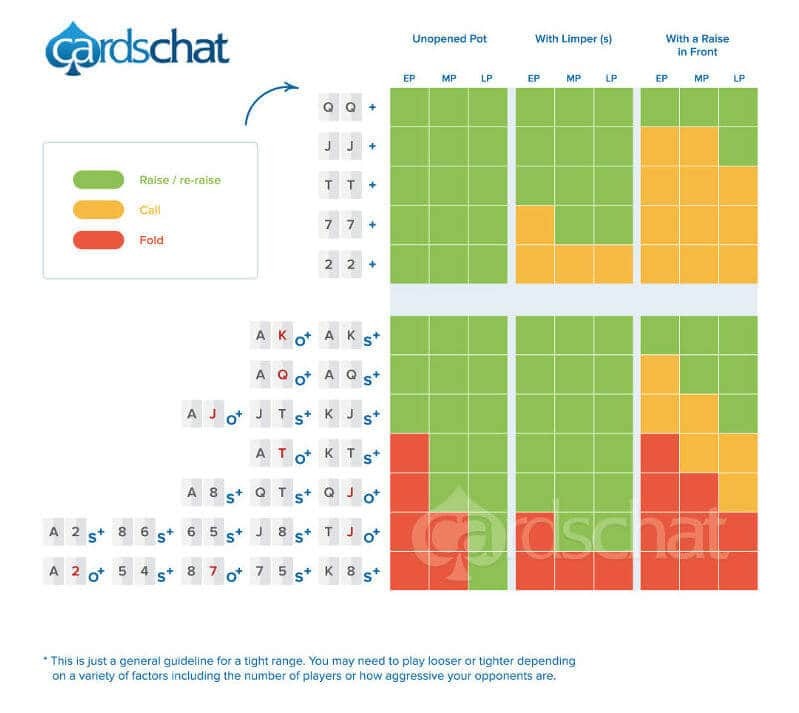 Established in 2004, CardsChat is now one of the biggest poker forums on the internet. The CardsChat team looking after things are all experienced poker players, passionate about their subject and eager to share ideas with players old and new. You can catch them at the WSOP event in Vegas every year, and get poker tips and player experience from the strategy guides they write here. And if you&apos;re ready to hit those tables and are looking for places to play poker online, then don't forget to visit our Poker Site Reviews section. As No Limit Holdem poker games are getting increasingly difficult, we are seeing more and more players transitioning to Pot Limit Omaha. Say hello to Pot Limit Omaha Poker! The term "Expected Value" (also referred to as "EV" or "Expectation") is used a lot in poker strategy discussions, and if you've wondered what it means but never dared to ask, this is the article for you! A common question amongst beginning poker players is, "How tight or how loose should I play?" More specifically they ask, "What percentage of hands should I play before the flop?" As a professional poker player for the past few years I feel like I&apos;m a great position to shed some light on this topic. Poker has played a huge part of my life over this time and several occassions throughout my poker career I found myself asking, "Am I addicted to this game?" We get a lot of questions about poker, and one of the most popular from inexperienced players is, "Can you make money playing poker?" The simple answer here is, "Yes." You've made the plunge: you've joined an online poker site, and you even deposited a starting bankroll. You're ready to play your first hand of online poker. There's only one problem: you have absolutely no idea what you're doing! You may know all about the World Series of Poker, but another poker series is quickly becoming nearly as popular! Learn everything you need to know about the European Poker Tour here. Poker Improvement – 7 Tips To Get Better At Poker! Fold equity in poker is quite simply a way of talking about how often your opponent will fold when you bet. For example, someone might say, "My bet is profitable because I am capitalizing on fold equity..."
Do you know the top 10 No Limit Texas Hold'em hands? Sets are my favourite type of poker hand. They are the easy hands to play and also one of the most profitable. For the most part all you have to do is bet and raise with them and try to get as much money into the pot as possible. Simple!